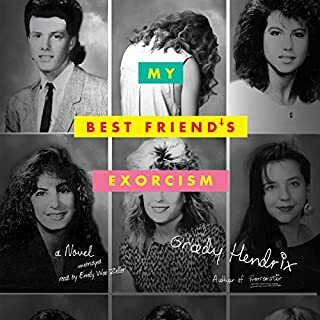 Where does My Best Friend's Exorcism rank among all the audiobooks you’ve listened to so far? I listened to this book in two sittings during a long road trip with my friend, and we kept busting out laughing or saying "ewww" or making faces throughout. It's one of the more entertaining stories I've listened to, both due to the way Grady Hendrix handles the topic (I mean, 80's "It" girls where one of them gets possessed? Come on!!) AND because the narration is more of a performance than someone reading to you. I don't think I could ever do that, but I did listen to it in two sittings, which is a first. It's just so entertaining. If you prefer audiobooks with straight narration, I would pass on this one because the performance elements are so strong. But if you do pass and you were curious about this story, then DEFINITELY read the paper version! Lastly, I gave the story four stars instead of five for a couple reasons. It's written from Abby's point of view, and because of that we don't get to see things that happen to and around Gretchen (the girl who is possessed) unless Abby is present. There are some things I wanted to "see" firsthand in the story that either we never get to know, or we find out secondhand when Abby finds out. Also, I didn't always believe the way the different parents acted. But overall I loved it!